The Kinzua Bridge State Park Visitor Center Non-peak operating hours. The Visitor Center located in Mt. Jewett PA is open 6 days a week from 8 a.m. to 4 p.m. Monday Thru Saturday, CLOSED on Sundays. We will be closed on Sundays until April 2019. Seasonal Hours: The Kinzua Bridge State Park Visitor Center Non-peak operating hours. The Visitor Center is open 7 days a week from 8 a.m. to 4 p.m. until Saturday, November 24, 2018. Effective Sunday, November 25, 2018 the Visitor Center will be open 8:00 a.m. until 4:00 p.m. Monday Thru Saturday, CLOSED on Sundays. We will be closed for the Thanksgiving Holiday on Thursday, November 22 and Friday November 23. We Will reopen on Saturday, November 24, 2018 at 8:00 a.m. The 339-acre Kinzua Bridge State Park, located in McKean County, is the home of the reinvented Kinzua Viaduct. The Viaduct, once the longest and tallest railroad structure at 2,053 feet long and 301 feet high, was partially destroyed by a tornado during 2003. Reinvented as a pedestrian walkway during 2011, visitors can stroll 600 feet out on the remaining support towers, peer miles out into the Kinzua Gorge, and gaze down through the partial glass platform at the end of the walkway. The Kinzua Bridge State Park Visitor Center and Park Office features great views, self-guiding exhibits, and information about the surrounding area. Picnicking and trail opportunities are available. The Kinzua Bridge Scenic Byway is a designated shared use hike/bike corridor. The skywalk will be closed when weather conditions are unsafe due to frost and ice in late fall through winter. Contact the park for current conditions. Due to unsafe conditions in the area of the downed towers, visitors are prohibited from walking under the skywalk and in the surrounding area as indicated on the map. The visitor center and park office is open specific hours. Contact the park office for facility seasons and hours. Kinzua Bridge State Park is four miles north of US 6 at Mt. Jewett on SR 3011. The skywalk gives close-up views of the viaduct and wide views of the Kinzua Creek Valley. The overlook is excellent for viewing the skywalk and the valley. Both views are great for viewing fall foliage, which peaks the first two weeks of October. The Picture Taking Platform under the skywalk allows visitors to photograph themselves and the remaining support towers in an interesting “3D” effect. 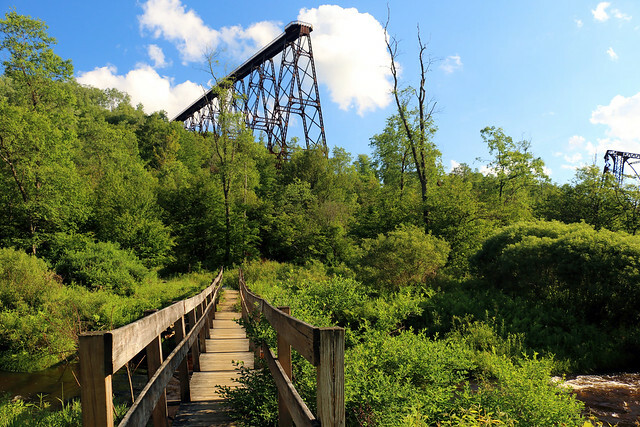 A short side trail from the Kinzua Creek Trail leads to the platform. The park offers a wide variety of environmental education and interpretive programs year round. Through hands-on activities, guided walks, and informational programs, participants gain an appreciation and understanding of natural and cultural resources. A variety of natural history and curricula workshops are available to teachers. These workshops are designed to provide information and ideas that can easily be integrated into the classroom. Programs focus on the themes of engineering, environment, nature, energy, and history. They correlate to Pennsylvania Academic Standards, vary in length, and most are STEM (science, technology, engineering, and math) related. Some programs begin in the school classroom and follow-up with a field learning experience at the park. These offerings are also available for homeschool groups. Contact the park for the program offering brochure, to request a specific topic, or to inquire about availability. All programs must be arranged in advance and may be scheduled by calling the park office. The Kinzua Bridge State Park Visitor Center and Park Office opened on July 1, 2016. It provides a location for visitors to interact with park staff, explore the history of the viaduct, and learn more about the natural landscape and wildlife. The visitor center features a reception area, gift shop, spectacular view of the skywalk, and two levels of self-guided and interactive exhibits that focus on engineering, environment, nature, energy, and history as they relate to the viaduct and local area. Some of the exhibits are hands-on for the enjoyment of all ages, while others include videos and original artifacts. The Kinzua Bridge Foundation, Inc. organizes a yearly fall festival that is held for two days during the third weekend of September that includes arts, crafts, food vendors, and musical entertainment. The foundation is a non-profit organization dedicated to the restoration and preservation of the Kinzua Viaduct, the promotion of the viaduct’s historical and cultural significance, as well as supporting the state park. A two-plug, electric-vehicle charging station is available for public use in the bus and RV parking area near the picnic pavilion. Please move to another parking space once your vehicle has been charged.